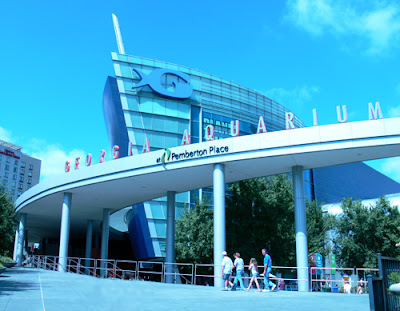 One week from today the new resident dolphins at Georgia Aquarium will premier in AT&T Dolphin Tales. I've been hearing about the dolphins since I moved back to Atlanta in August of last year so my excitement is nearly uncontainable. While you're in Pemberton Place, pop by the World of Coca-Cola to see their newest exhibit, "Coca-Cola Expedition 206," a story about three young people who set out to visit as many as possible of the 206 countries and territories where Coca-Cola is sold. The visited 186! And by time the dolphins take to the "stage," just acrosse the street the Fountain of Rings in Centennial Olympic Park will have undergone its renovation and be ready for its daily performances.